Breaking: Patterico reported this tonight. 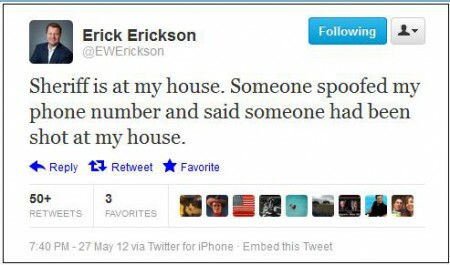 A bogus 911 call sent police tonight to the home of Kimberlin critic Erick Erickson. We wrote about this dangerous lunatic Brett Kimberlin here at Gateway Pundit on Friday. I just got off the phone with Erickson. He says the caller reported an “accidental shooting” and that it was therefore less traumatic than my experience. However, he said, his kids were outside as the police showed up with lights flashing — and some of the cops were keeping their hands on their guns even as his children were running around. Erick wrote about this horrible ordeal here. Isn’t it about time the far left condemns this? Before someone gets killed? UPDATE: Michelle Malkin posted a to-do list following Friday’s Kimberlin blogburst.